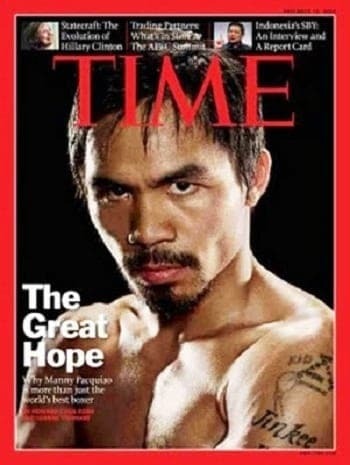 To be honest, unlike most of my compatriots, I’ve never been a fan of Manny Pacquiao. He’s considered a hero where I come from, because of his inspiring rags-to-riches story – but this time, instead of a street smart instinct, he made it to the top thanks to raw athletic talent. Which is admirable in its own right. There’s no doubt about it, the man is a boxing legend. You only have to see his track record, or watch any of his past matches, to see he’s in a league of his own when it comes to the sport. Look what happened with Erap (Joseph Ejercito Estrada, the action star who made it to the presidency and then got ousted for corruption) – he nearly won the presidency a second time in 2010. Disgraceful, it’s like we never learn. And I don’t think I’m the only one sick and tired of getting public servants who were voted in by the masses as if our elections were some kind of comedy TV game show. In 2007, he ran for a seat in the Philippine House of Representatives and lost. 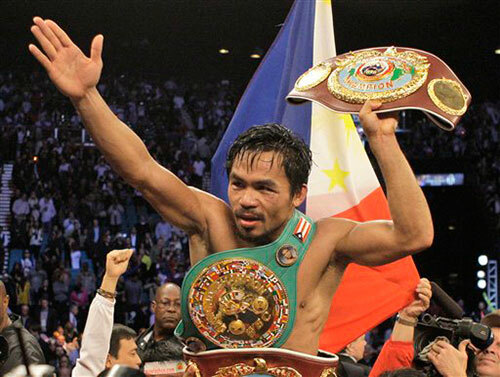 In 2010, Pacquiao ran for the congressional seat, but this time in Sarangani province, the hometown of his wife Jinkee. He scored a landslide victory over the wealthy and politically well-entrenched Chiongbian clan that had been in power in the province for more than thirty years. 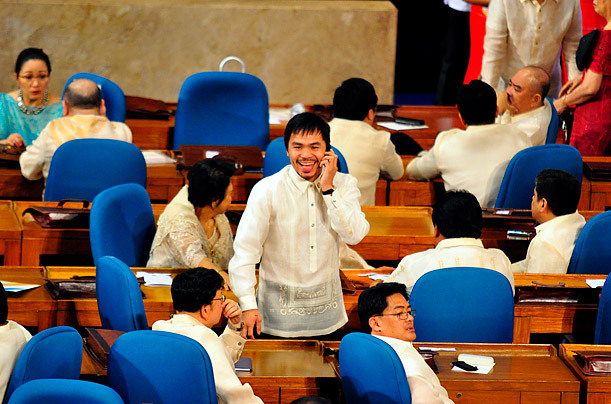 In 2013, Pacquiao ran unopposed for his 2nd term as congressman. His wife Jinkee was also elected as Vice-Governor of Sarangani, while his younger brother, Rogelio ran but lost at the 2nd district race in South Cotabato. DO YOU SEE WHAT’S HAPPENING, PEOPLE? 1. Pacquiao’s political mentor is Luis “Chavit” Singson, a “gangster governor”, local warlord and crime boss charged with graft among worse things – like murder and hunting endangered animals. 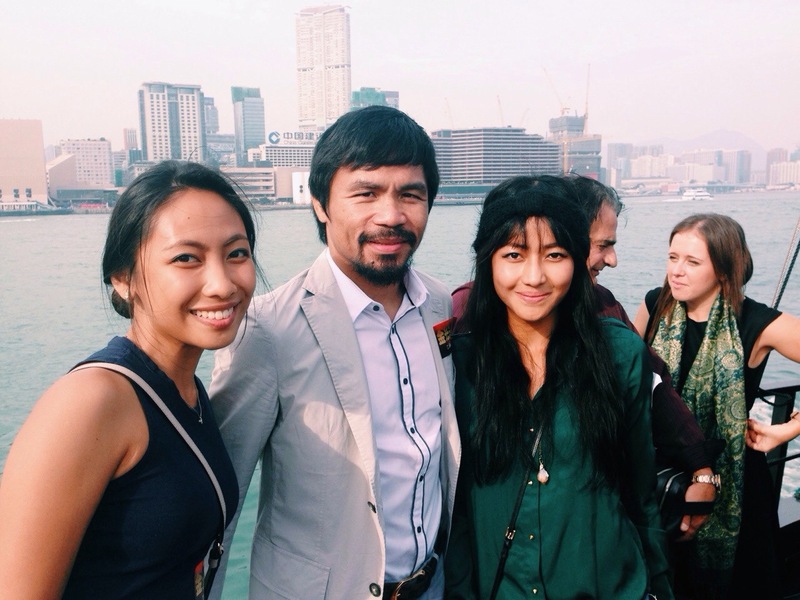 Pacquiao justified the vote by citing his devout Catholic faith (before he converted). This was castigated as hypocritical, especially given reports on his womanizing. But this post is not about bashing Manny Pacquiao, who I still ultimately respect as a person and a sportsman. In fact having met him last month, my impression of him is of a kindhearted and soft spoken guy. Not exactly the sharpest tool in the shed, but maybe the one with the most impact! At the front row, we caught sight of Sylvester Stallone and Arnold Schwarzenegger, plus Stephen Baldwin, Ja Rule (who hosted the pre-fight party at Bellini Lounge Saturday night), Jermaine Jackson (Michael Jackson’s brother), and Pussycat Doll Melody Thornton (who sang the US National Anthem before the main event). Vanness Wu, Cung Le and Edison Chan were also present. Hollywood action heroes Arnold Schwarzenegger and Sylvester Stallone sit with Edward Tracy, President and Chief Executive Officer of Sands China Ltd. Even if I’m not into boxing, I swear the atmosphere was infectious. I came in after the latino undercard in which Jessie Vargas (US) defeated Antonio DeMarco (MX). I heard this one was a fun-to-watch, intense match. Vargas retained his WBA world super lightweight title. This was a completely one-sided match. I was rooting for Thailand but he didn’t stand a chance against the powerful Ukranian WBO Featherweight champion. Although Chonlatarn has more professional experience, as an amateur Lomachenko won the gold medal at the 2008 Beijing Olympics in the featherweight division and 2012 London Olympics in the lightweight division. A totally useless match. They weren’t even fighting for a title or anything… don’t know what this was for. It wasn’t even great. All in all, I’ll have to admit it was a fun watch, an exciting once-in-a-lifetime experience, and I’m really glad I got to see Pacquiao fight and win before he retires. Hope you enjoyed the read from a girl’s point of view. Great post! Love the images, too. You can definitely feel the energy! 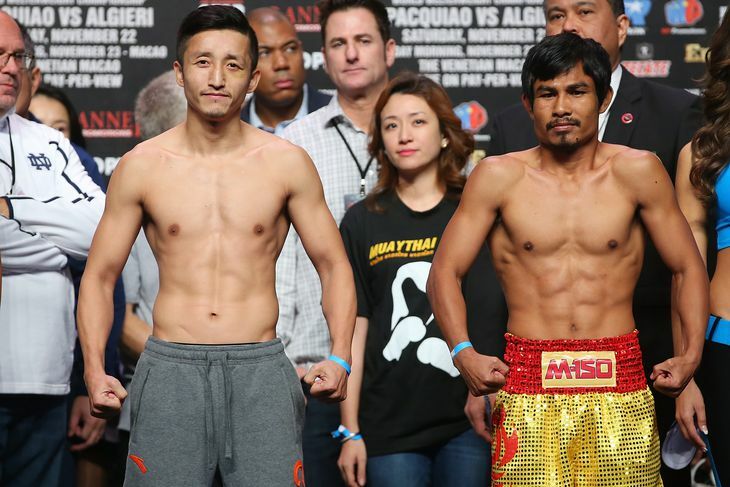 You got to meet pacman and watch him fight live. Great insight on thr backgtound of politics to start the post. It will be interesting to see how casino resorts affect the geopolitical environment in the Philippines.